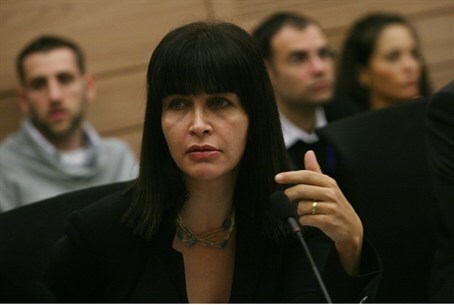 MainAll NewsDefense/SecurityKnesset Member Calls Arab Refugees "Manufactured"
Knesset Member Calls Arab Refugees "Manufactured"
"Babies in Gaza are getting refugees status," MK Wilf stated. "Why are we collaborating with the Arab desire to perpetuate the conflict?" CORRECTION: The amount of actual living Arab refugees in 2012 as calculated by MK Wilf and her staff is 30,000, and not 300,000 as previously stated. The number was calculated from the original 700,000 refugees from the 1948-1949 war. Member of Knesset Einat Wilf (Independence Party) is calling for "restructuring UNRWA on the road to peace." In an interview with Israel National Radio's Josh Hasten she stated, "The continued existence of this organization and its operation to continue to manufacture refugees from the same old war doesn't signal peace." The interview was conducted live on Hasten's Reality Bytes podcast. UNRWA is the the "United Nations Relief and Works Agency for Palestine Refugees in the Near East." According to its website, the organization "provides assistance, protection and advocacy for some 5 million registered Palestine refugees in Jordan, Lebanon, Syria and the occupied Palestinian territory, pending a solution to their plight. UNRWA is funded almost entirely by voluntary contributions from UN member states." MK Wilf stated, "babies in Gaza are getting refugees status. They are under their own government. Why are we collaborating with the Arab desire to perpetuate the conflict?" MK Wilf said the desire for a "right of return" of refugees to enter within Israel's borders is contrary to the "two state solution." Such a solution calls for a separate State of Israel for those of Jewish ethnicity and a State of Palestine for those of Arab ethnicity. She commented that those who considered Jewish communities in Judea and Samaria to be an obstacles to peace should at least equally consider UNRWA's refugee camps to be so as well. MK Wilf noted sarcastically the breakdown in amount of money that countries donate to UNRWA. "I love the fact that out of UNRWA's billion dollar budget the Islamic Bank, which represents the 56 Islamic states, gives $7 million," she said. "Those are countries that are helping their Arab brethren. The United States gives $250 million. The remainder of that budget is funded by various European countries, Australia, and Japan." As far as the actual number of Arabs that left Israel during the war that lasted from 1948-1949, MK Wilf questioned that statistic as well. "We calculated 30,000," she asserted. "Today there would be about 30,000 living people who lived in what is today Israel before 1948 that could get the title of refugee." "The traditional equation is the following," MK Wilk stated. "UNRWA will be dismantled after we have a comprehensive and final peace agreement. I say we need to change this equation. UNRWA needs to be restructured now if we are ever to make peace possible in the future." MK Wilf proposes that Israel convince donor countries to no longer list their donations as money given to refugees. "They believe they are providing humanitarian assistance," MK Wilf commented. "By all means continue giving the money, but disconnect it from a refugee status." For the full interview with MK Einat Wilf, click here. Josh Hasten hosts Reality Bytes live every Tuesday, Wednesday and Thursday from 10:00 AM - 12:00 noon Israel time on Arutz Sheva's live streaming internet radio station. For free podcast archives click here.